My first year in college, after a long winter of heavy snow and hibernation in semi-remote Eastern Oregon, I trekked home for my first annual Easter weekend visit. I brought my roommate, Christine, and my mom made Strawberry-Rhubarb Pie. After months of food hall meals, it was the best pie I had tasted. 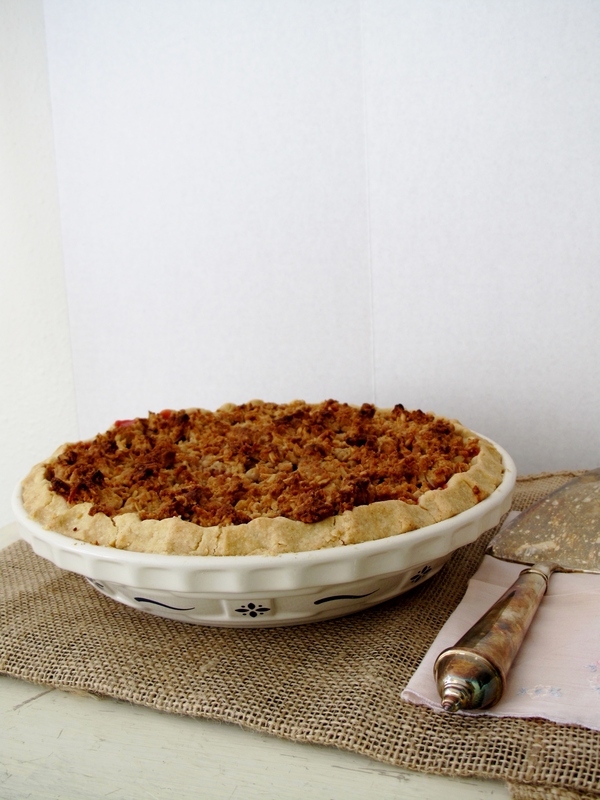 Every pie since has been held to the standard of that memory of tart, sweet, vibrant spring-ness. 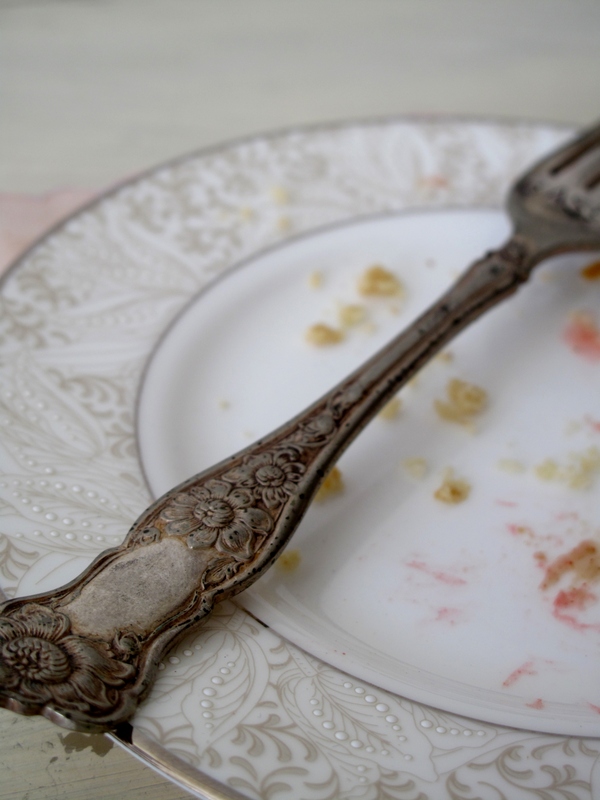 Nothing compares to the picture in my mind of being home, surrounded by family and a friend, and slowly savoring each bite. When asked about her strawberry rhubarb pies, and any others for that matter, my mom answers exactly as I would expect and as I expect my grandma would also have answered: “I don’t ever follow the recipe, I just add ingredients until the pan is full and add sugar as needed.” While I concede her reasoning, I’m slightly more type A, and I foolishly think that if only I had that recipe, I could better relive the memory. Though I was left to my own devices as to the amounts and types of ingredients, my tiny apartment kitchen happens to have a couple pie-baking essentials thanks to my mom and grandma. Like a good luck charm, I always use this pie dish, which mom had the forsight to know I was going to need waaay back when I was in high school. Grandma Neah’s old copy of The Fannie Farmer Cookbook is also a regular kitchen fixture for pie making inspiration, though I’m a bit too much like these ladies to actually follow the recipes. Even so, I’m glad Neah made sure I received it before she passed. With these feel-good implements to boost my confidence in measuring up to that pie, I began. This year, a full eight years after that first annual Easter weekend trek, I made it home again. 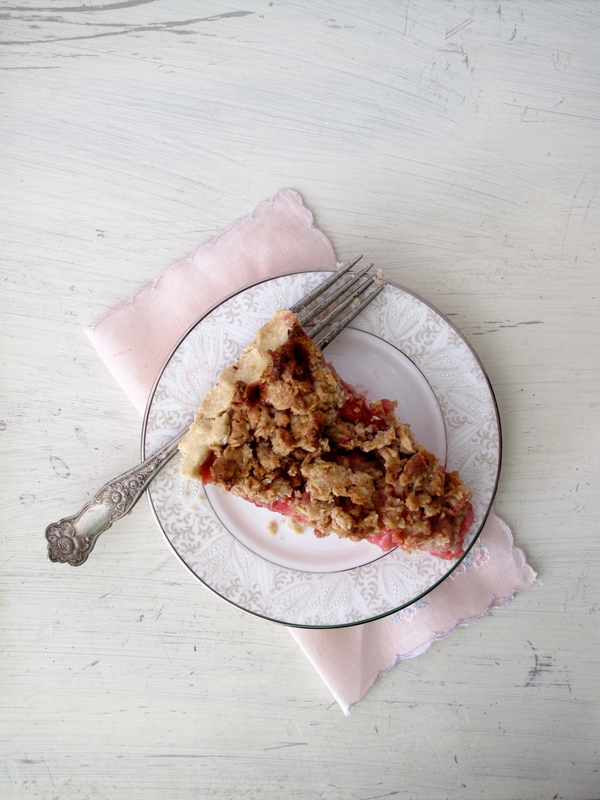 Though this pie was decidedly missing from our Sunday table, strawberries were bought and ate, and like firewood, mom loaded me up with a couple armfuls of rhubarb for the road. The important thing and what I keep holding on to in this sort of strawberry rhubarb tradition, is that family was gathered around, more family than before, and we lived a spring day to rival my memory. 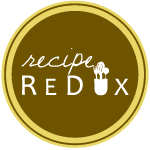 To make the crust, measure flours, sugar, and salt into a food processor. Pulse a couple times until they are mixed. Measure in coconut oil and pulse until the mixture is crumbly. Then add in water and vanilla until the mixture just comes together. Turn out onto a piece of parchment paper and split the dough into a larger piece (about 2/3 of dough), and a smaller piece. Roll out the larger piece and fit it into the bottom of a pie pan. If it falls apart in the process, gently piece it back together and flute the edges. Using the tines of a fork, make several stabs into the crust, and then put it into the freezer for about 45 minutes. Meanwhile, put the remaining 1/3 crust back into the food processor, along with the honey, oats, cinnamon and ginger. Pulse until they come together and set aside for the streusal topping. To make the filling, stir together the rhubarb, strawberries, sugar, honey, flours, lemon juice and ginger. Once the bottom crust has chilled, turn the filling into the pan. Evenly spread the streusal topping over the filling and bake for about 50-60 minutes, or until the filling is bubbling properly. During the bake time, you may need to cover the pie with foil, to prevent excessive browing. If the filling seems a little liquidy at this point, don’t worry. It will set up nicely once it cools! What a beautiful Spring pie and memory! 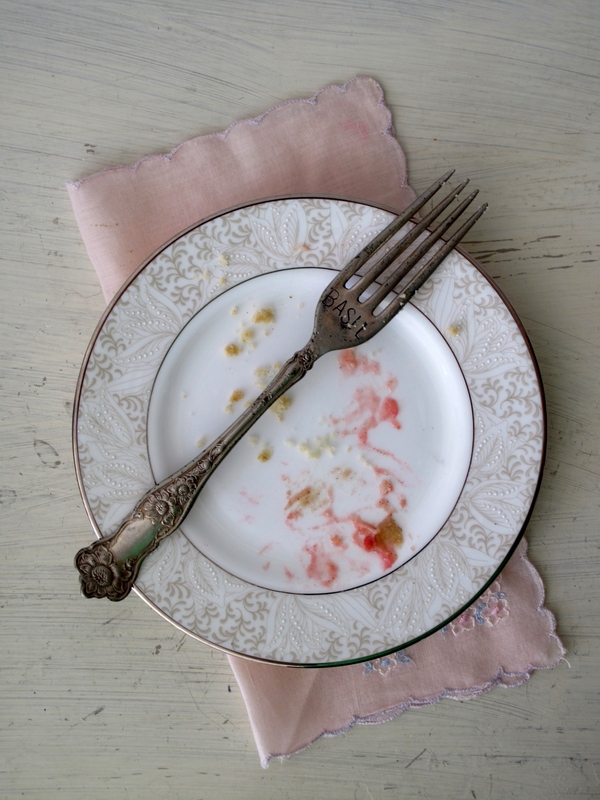 I love your description of your first Easter trip home from college complete with a strawberry-rhubarb pie. It looks amazing! 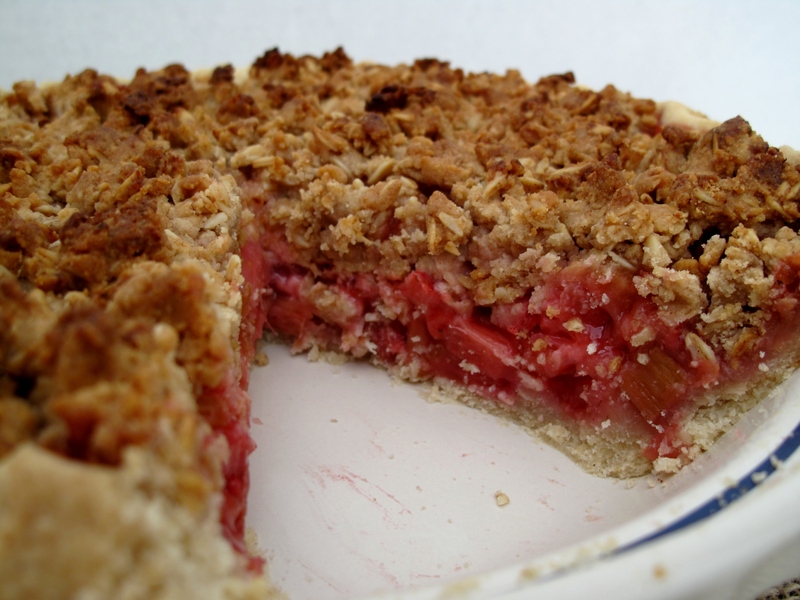 Brilliant use of rhubarb – it makes really delicious pies. 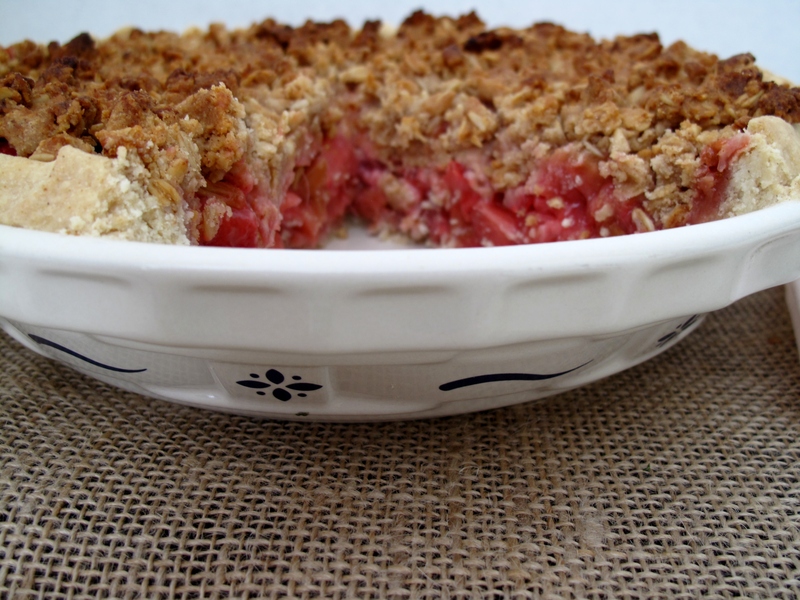 Love strawberry and rhubarb together and always love a crumble topping! Gorgeous pie! 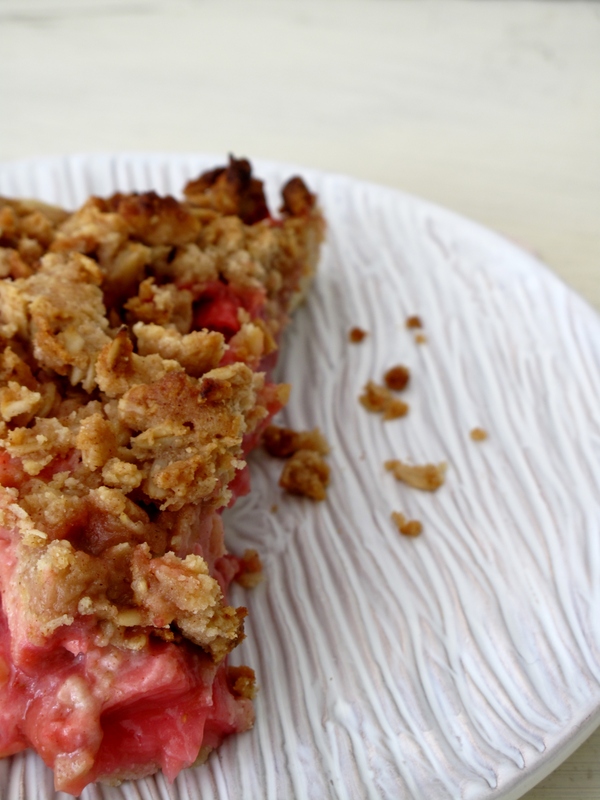 Strawberry and rhubarb is such a classic, delicious combination. Yum!